The Tarot cards are the descendents of the archetypes of transformation. I have been reading Tarot cards for over thirty six years. Since 1986 I have been giving Tarot workshops at the New York Open Center as part of their ongoing faculty. In these years of studying and teaching, I have evolved into a Master Tarot Card Reader. The Tarot is a living Oracle; it enables us to communicate with levels of consciousness not normally available to the conscious mind. Many say that it is our own subconscious speaking through the cards; others say it is the Higher Self or the Divine Mind. Tarot is one of the best tools for guidance that life has given to us. It shines a clear light on even the most troubling, murky or confusing situations. 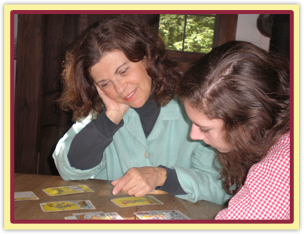 A Tarot reading can quickly offer you a deeper understanding of yourself and your options. It opens up the places where you have been stuck, confused or troubled. A reading will show you what you need to know to take the next step in your life, and where to put your focus to find satisfaction. You may use this time any way you like. For example, you can choose to go deeply into the Tarot or combine Tarot with other of my mystic arts to look at your life from different perspectives. You and I will discuss in advance what you want to gain from the reading and we will design it to suit your needs. One of the gifts I was given was the ability to synthesize information and to communicate in a clear, gentle and understandable manner. All sessions will be recorded, in mp3 format, so that you can listen to this material again at your leisure. Each reading provides an enormous amount of valuable information. Recording the reading enables you to relax and be completely present without the worry of what you will remember. Readings are done in person, at my home, in Manhattan’s Greenwich Village, or by phone. I live on a charming landmark street that is easily accessible by public transportation.